With the help of the given from the Above two keys to the symbolics of consciousness we have been decoded many hundreds of complexes of extraterrestrial civilizations throughout the world. As a result, we have composed «The Dictionary of analog and digital symbols of consciousness» of extraterrestrial civilizations of more than 300 symbols. In the System of information transmission of extraterrestrial civilizations, there are two types of symbols – analog and digital. Analog symbolics reveals the basic principles of work of consciousness. Human being is presented in it in the form of an individual information cell. Analogsymbolicsallows to show a shift of a cell’ brain area from the center tothe borderand itsexpansion for information exchange at the unification of consciousness. Digital symbolics inform about the level of consciousness of objects. Human consciousness is represented in it as trident. Trident informs that a human of the Earth has the fourth level of consciousness. Three tooth of trident represent three previous levels of consciousness that are included in a human cell. These are levels of consciousness of stars, inorganic and organic nature of planets. Trident can be depicted in different ways; however, in spite of the form of representation, it transfers the same information about human consciousness of the fourth level. We were shocked when we found analog and digital symbolics of consciousness as the main linear ornament encircling from all four sides the world-famous Parthenon, as well as many other ancient temples of the Acropolis in Greece! In this ornament, which is passing under the upper cornice of the Parthenon, trident with expanded teeth alternates with bas-reliefs – metopes, which from different sides reveal the content of the symbol depicting human consciousness. Thus, trident in the Parthenon and other ancient Greek temples has a special name – triglyphs. As is known, «triglyphs – is a repeated decorative element of the Doric frieze - a rectangular tile, divided by grooves into three vertical parts. At the bottom it is decorated with small teardrop-shaped protrusions – guttaes». Thus, the ornament on the facade of the Parthenon is presented by alternating elongated narrow-tridents-triglyphs with guttaes and square tiles metopes with bas-reliefs. 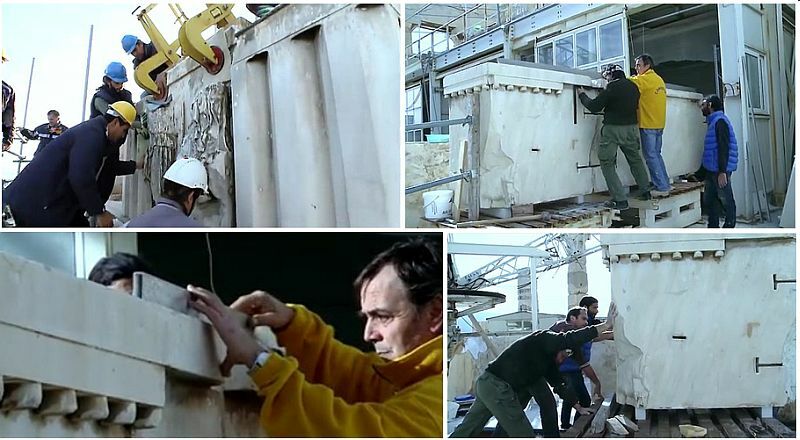 And today, work on the restoration of the Parthenon is continued. So, Vitruvius presents the symbol of consciousness «trident», as an ornamental decoration. This way, the symbol of consciousness becomes an element of architecture. 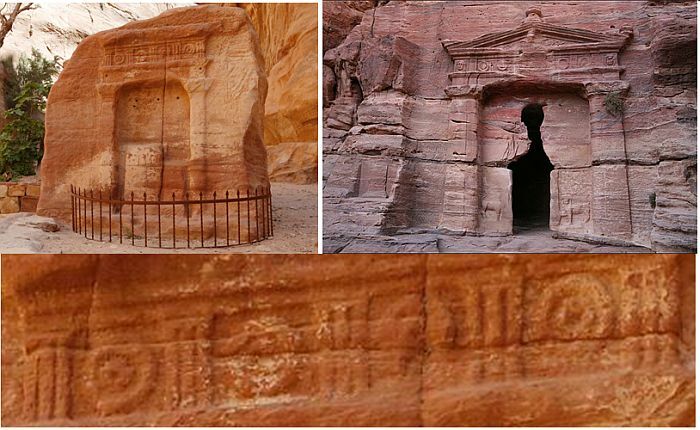 Erroneous of assumption of Vitruvius prove rock tombs in Petra, Jordan, and Mada'in Saleh in Saudi Arabia. In these complexes on the facades of tombs carved in rocks and not containing wood elements, are well represented ornaments with trident identical to trident of the Parthenon. Thus, the symbolism of consciousness of extraterrestrial civilizations in the ancient Greek temples had been mistakenly taken for decorations of building construction. Besides the Parthenon, triglyphs are widely represented also in other numerous ancient Greek temples. 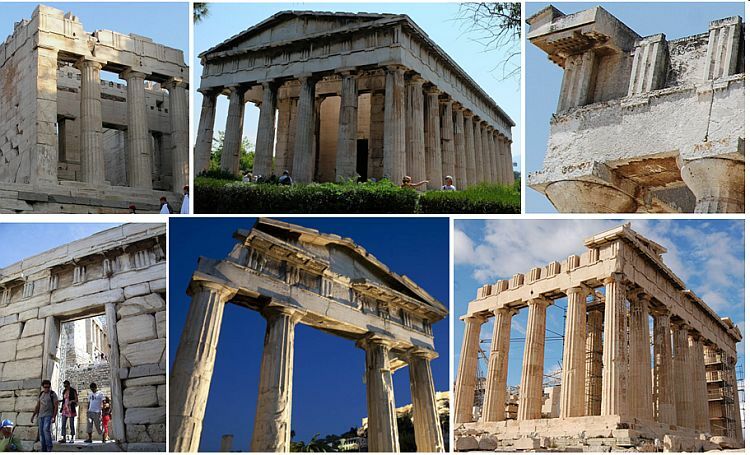 They can be seen on the Propylaea and the Beule's Gate in the Acropolis; Temple of Hephaestus in Athens; Gate of Athena Archegetis on Roman Agora in Athens; Temple E, the so-called Temple of Hera in Selinunte, Sicily; Temple of Zeus at Olympia; the Temple of Aphaia on the island of Aegina and others. It has to be noted that on the territory of all ancient Greek temples, created by extraterrestrial civilizations with the help of the action of the united consciousness, happens a deep harmonization of all systems of a human body, which has a beneficial effect on health. 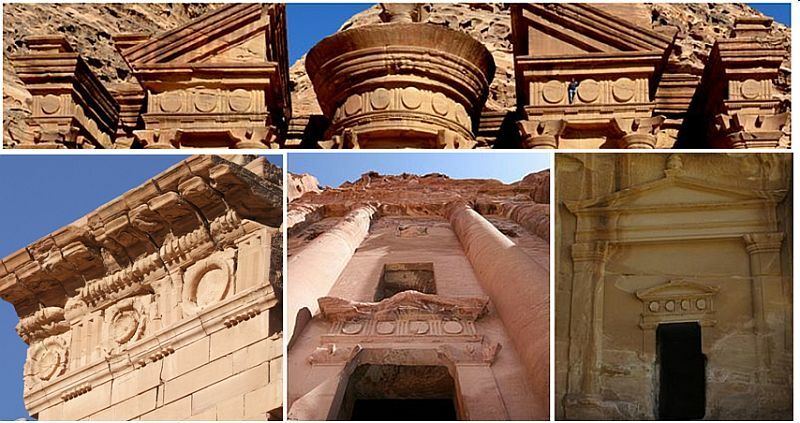 The study of these ornaments on the rock tombs of Petra and Mada'in Saleh disclose information transmitted by blocks on the cornices and tridents with guttaes in the Parthenon. It should be noted that information is transmitted not only by ornaments, but also by all elements of temples, their shape and location. The information transmit columns, pediments, porches, gates, entrances, stairs, statues and bas-reliefs, as well as other details. In this article we consider only some of them. 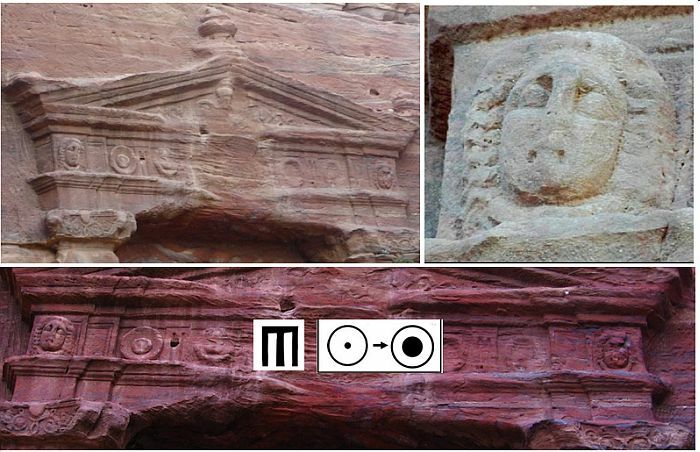 Images of the two symbols of consciousness – a trident and a cell – are presented in the rock city of Petra in Jordan, as well as in Mada'in Saleh in Saudi Arabia in two types of ornaments, with rhythmic alternation of these symbols. Another ornament consists of multiple repeating of the block «expanding trident – six cones» and a large circle. Let’s consider the content of these ornaments. Ornament «trident - individual cell» is presented in Petra in the Triclinium of the Lions, on the temple of Dushara deity in the passage Siq and others. In this ornament is presented ordinary trident without expansion of teeth. 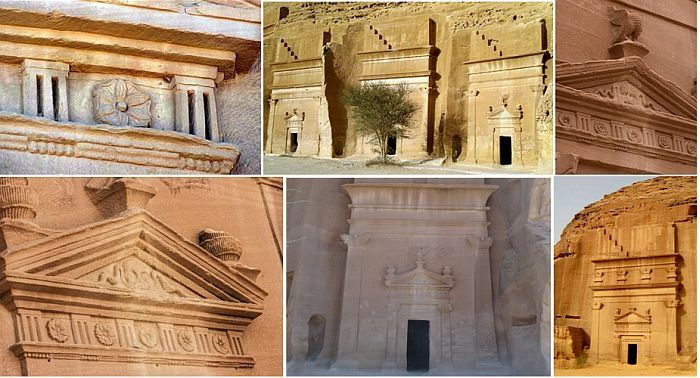 Ornaments of similar symbols can be seen also in the complex Mada'in Saleh in Saudi Arabia, where the facades of tombs are carved out of the rocks the same as in Petra. Meaning of symbols in this type of ornaments is disclosed in the Triclinium of the Lions, where over the opening of the entrance is presented one of them. On both ends of the ornament is depicted the human head. On the one hand, the image of the Head explains that the two alternating symbols – trident and cell – are the image of a human being and his consciousness in analog and digital systems of coding of symbolics of consciousness. However, on the other hand, the image of two Heads of people represents the Principle of the united consciousness. This information confirms the expansion of the brain area of the cells depicted in the ornament. Thus, these ornaments acquaint with the main symbols of consciousness, which depict a human being. They inform that trident and cell of an individual consciousness – are symbols-analogues, which depict a human and his consciousness in the two coding systems – analog and digital. In another type of ornament in Petra is presented trident the same as in the Parthenon – with expanded teeth. Under each trident, also depicting human consciousness, there are six expanding cones. So, the line of ornament consists of alternating symbols of consciousness – the block «expanding trident – six cones», and also large circle. Ornament of this type is presented on Ad-Deir – the main building of the complex Petra, on the Obelisk Tomb and the Urn Tomb, on the separate standing building Qasr Al-Bint, in the tombs of the Little Petra and others. Location of this type of ornament on the main tombs of Petra indicates that the information they transfer is very important. Analogous ornament in the complex Mada'in Saleh. An analogous ornamentof alternating symbols of consciousness – the block «trident-small teardrop-shaped protrusions under it» and a flower – is widely represented in many tombs of the rock complex Mada'in Saleh in Saudi Arabia. However, in this complex most of tombs are much more ornamented with symbols of consciousness than in Petra. In Mada'in Saleh can be seen serpent – the symbol of cataclysms, Eagles – Birds of the Transition and so on. Therefore, depending on the transmitted information, the number of teardrop-shaped protrusions under tridents maybe be 5, 6 or 7. That is why the tridents in this complex are usual, without expansions, because they are complemented by the images of Snakes, Eagles and other symbols of consciousness. This is the fundamental difference between the complex Mada'in Saleh and Petra. Thus, the number five – by the number of small teardrop-shaped protrusions under tridents – indicates the fifth level of consciousness – the united consciousness, required for the Transition. 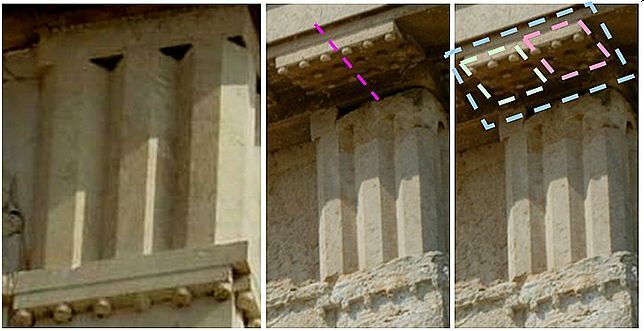 This information complements the bird Eagle – the symbol of the Transition placed over the top of the pediment. Number six – informs about carbon-base, emphasizing thereby that this information is about a human. In addition, the number six inform about the association of consciousness of two people in each information cell of which are included three previous levels of consciousness. Number seven points on the planet Earth – the seventh planet of the solar system. So, what information transfers the ornament of alternating symbols «expanding trident – six cones» and large circle, and also why is used a special type of trident with expanded teeth? The purpose of creation of all complexes of extraterrestrial civilizations – is to inform humanity about upcoming cataclysms of incredible power, and the necessity to make the Transition to another secure Highest level of the material world by uniting of the consciousness of humanity. The unification of consciousness is necessary for a body transformation. The process of unification of consciousness is accompanied by an expansion of a brain area of a human cell. Just this the most important process extraterrestrial civilizations represent to humanity by symbolics of consciousness. However, only analog coding system allows representing the process of unification of consciousness. For this purpose, there is even a special symbol – an information cell with expanded brain area. To show this process of expanding a brain area of the cell in the digital coding system is impossible. That is why for transfer this information extraterrestrial civilizations had used several techniques. Expanding trident and six expanding cones. First of all, extraterrestrials had made teeth of Trident expanding downward over the entire length. To do this, they presented the teeth in the form of a straight prism with equilateral trapeze at the base. In addition, extraterrestrial civilizations had combined digital and analog symbols. In the result was formed a special block of combination of two types of symbols. Thus, at the upper part is presented a digital symbol – Trident with expanding teeth and at the bottom – analog symbolics which depict the expansion of a brain area of a human cell. This information about the expanding of a brain area of a cell is transmitted via expanding downwards truncated cones. Therefore, expanding cones enhance and complement the information transmitted by the Trident with expanded teeth about the necessity of transfer from individual consciousness to the unified consciousness of civilization. Furthermore, strictly above the cones extraterrestrials made a straight convex line, meaning that these are not separate elements, but a one block of six elements. Here is the block of the ornament. Thus, trident is depicting human consciousness, and six expanding cones directly under trident inform what happens with consciousness of this human. It turns out that this human unites consciousness, and, as a result, a brain area of his cell expands. Consequently, numerous repetitions of alternating tridents and large circles in the ornament of tombs in Petra represent a lot of people standing one after another and uniting consciousness. So is shown the unification of consciousness of humanity for the Transition. The same information is transferred by the murals in the Pyramid of the Moon in Peru. The mural shows a lot of people who are standing holding hands and forming a long line. On the heads of people are shown truncated cones with expansion toward the top, which depict the expansion of a brain area of their cells at the uniting of consciousness. Why number of cones is six? Number «six» indicates on carbon basis of humanity because carbon has a serial number six in the periodic table of the elements of D. I. Mendeleev. Consequently, block «trident and six truncated cones under it»informs that each of three previous levels of consciousness, included in a human cell, and depicted by a trident, has carbon base, designated by number six. So, by the digital symbolics is represented the number «666». This is so-called the Number of the beast, a human and apocalyptic, about which warns the Bible, because it is considered that it will be revealed before the End of the World. Besides, six cones inform about association of consciousness of two people, each cell of which includes three previous levels of consciousness. So is shown the Principle of the united consciousness – the basis of transition to the next cycle of life. It turned out that the Number of the beast, or the block «666» is depicted on the pediment of the Parthenon. Moreover, this block is widely represented across the Acropolis and other ancient Greek temples... However, compared with the ornaments on the tombs of Petra in Jordan, this block had been a few changed for a more detailed explanation of the transmitted information. So, in Petra under tridents with expanding teeth are depicted six expanding cones. It informs that humanity has to unite consciousness, which is accompanied by an expansion of the brain area of individual cells of people. Thus, the number six, as noted, indicates on carbon nature of humanity. In the Parthenon in order to transmit the same information, expanding cones under tridents of the analogous shape are replaced by the cylinders-guttaes. Furthermore, perpendicular to the plane of tridents is mounted overhanging from the top cornice, along entire length of which are presented three rows of six the same cylinders. Guttaes depict a brain area of an individual human cell, showing that this information is about a human being of the Earth, because the number six indicates carbon nature of humanity. Three rows of cylinders along entire length of the overhanging cornice are repeatedly separated by wide bands into blocks by six pieces, monotonically arranged over each trident and every metope, thus underlining their absolute identity. Cylinders on the cornice and guttaes under tridents by size and transmitted information also are identical. Thus, each block is a rectangle, in which are set three rows of lower cylinders by six pieces, i.e. 18 in each. The block over trident, which includes three rows of six cylinders in each, reports that each of the three previous levels of consciousness within human cell has carbon nature. On the other hand, the block at the top indicates on the unification of consciousness of two people, each cell of which includes three previous levels of consciousness. Hence, in Petra, the necessity of unification of consciousness of civilization, which is accompanied by the expansion of brain areas of human cells, is presented briefly, just by one symbol – trident with six expanding truncated cones under it. This is the block «666». In the Parthenon the same information is explained in details in two blocks - triglyphs with six cylinders under it, and also 18 cylinders above it. So, the block «666», warning about danger of impossibility of the unification of consciousness for the Transition, in the Parthenon is presented more detailed. The uniqueness of the great Parthenon consists, that it reveals to humanity the main condition for continuation of life. Only fulfillment of this condition, presented by the added blocks, will allow to make the Transition successfully. The Number of the beast 666, revealing carbon nature of humanity, warns about extremely broad and rigid boundaries of individual cells of people, reflecting the imperfection of three previous levels of consciousness – fury of stars, ferocious of animals, indifference of minerals. Wide carbon border of human cells prevents the information exchange at the association of consciousness of people, thereby forming, deep individuality of a human. Wide borders of human cells manifest in hate, wars, acts of terror, indifference to the fate of other people, a huge number of suicides and etc. Consequently, carbon nature of Earth mankind prevents the unification of consciousness and therefore represents mortal danger for the Transition. Thus, the block «666», presented in the Parthenon not only warns about mortal danger for the Transition, but also indicates on the necessity for unification of consciousness of humanity, revealing the only way for salvation in global cataclysms. Extraterrestrial civilizations on numerous examples demonstrate to mankind extremely broad and rigid boundary of a human cell, about which he does not even know. 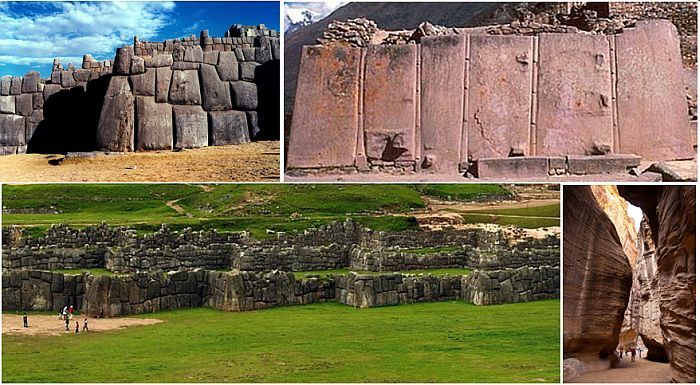 These are three cyclopean gear shafts of Saksaywaman in Peru, the Wall six megalithic of the temple of the Sun in Ollantaytambo, Peru, hundred-meters height walls of the passage Siq in Petra, huge tall walls of the fortress Kuelap in Peru and others. High and thick walls of the Acropolis in Greece, located on a cliff of about 150 meters height above sea level. It is considered, that in the XIII century BC the Acropolis was fortified with stone walls, of thickness of 5 meters, which according to legend was erected by Cyclops – creatures of supernatural power. As it is known, part of these walls have preserved today. They are presented, for example, behind the south wall of the Propylaea. These walls of the Acropolis also represent an unusually wide border of human cell, about which informs the Number of the beast 666, presented by a linear ornament by triglyphs with two blocks of cylinders – upper and lower. These illustrative examples of extraterrestrial civilizations show that borders of human cells are impossible to soften for deep unification of consciousness at the Transition. This imperfection of consciousness can only be overcome consciously overturning hate to mutual understanding and love. About this overturn of consciousness warns for two millennia the inverted cross of St Peter. Thus, the Parthenon, as well as other ancient Greek temples, which ornaments contain trident-triglyphs with guttaes, as well as the rock cities of Petra, in Jordan and Mada'in Saleh in Saudi Arabia are built not by people, but by extraterrestrial civilizations. Ornaments of the Parthenon and other ancient Greek temples by its content are identical to ornaments on the rocky tombs of Petra and Mada'in Saleh. They consist of a rhythmic alternation of digital and analog symbols of consciousness in Petra and Mada'in Saleh. In the Parthenon analog symbols are replaced by images in the metopes, which reveal their contents. 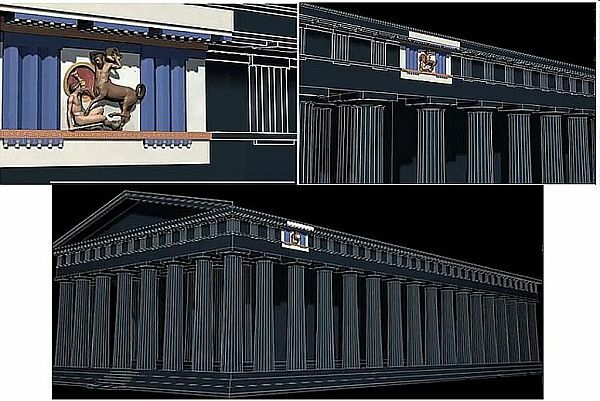 However, the ornaments of the Parthenon for mankind are more important, because the bas-reliefs in the image shape reveal the content of symbolics of consciousness, indicating thereby what do for the continuation of life.